Every fan's dream come true, and a fantastic revelation for all audiences. An incredibly well constructed and well designed piece of work - bringing new realms to life in a competent, engaging storyline. They achieved the impossible dream - bring a dearly loved character to the screen straight from Ditko's art with the right depth and perfect casting. Artist Steve Ditko wanted to bring new dimensions to the Marvel universe. Rival Jack Kirby was taking his fistfights to expansive backdrops, from tech palaces to outer space, while Ditko's Spider-Man was distinctly grounded in urban and internal battles. But with Doctor Strange's 1963 debut, his personal quest to express abstract truths into visual forms found a forum; his art unexpectedly opened up into freeform Dali vistas that challenged space and perception, transforming the artist, the company, and the readers. 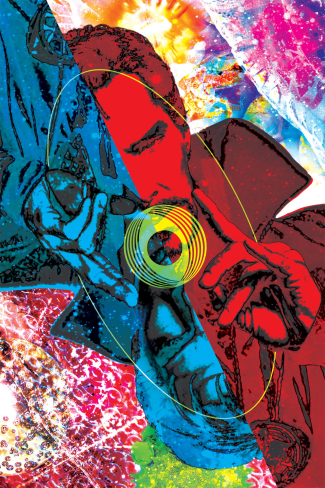 The mystic mage sideswiped Kirby's physicality with the metaphysical, from astral projection to the pan dimensional, traversing through cubist hallucinations of inverted geometries, synaptic molecules, corroded webs, and gem clusters. The symbolist and spiritual series naturally illuminated the counterculture, who embraced the hero in concert posters, songs, and album covers. Perversely, Ditko was disgusted by them and quit to create the indie character/ reactionary avatar "Mr. A", devolving his symbolist landscapes into wastelands of Randian moral absolutism. But the art and the character had opened doors of perception that couldn't be closed. Dr. Strange changed comics, and does so again for cinema. Now all of Marvel's varied realms are unlocked: the Guardians Of The Galaxy opened up the Universe, Ant-Man opened up the Microverse, and Doctor Strange opens up the entire Multiverse. Each 'superhero film' is actually its own unique genre by character, so he also supercedes mainstream expectations of superheroes with the supranatural. And while magic films (Harry Potter) and head-trips (Inception) are common now, this smart film upends the end-ups into whole new levels. Benedict Cumberbatch, ranking among the most perfect castings ever, facets the Doctor with fluid edge, slyness, grace, and vulnerability. Even amid the most astounding visuals and wildest concepts, the film stays consistently grounded with character interplay and gentle humor, always staying clear while flowing fast. Despite some reactive opinions to the contrary, this is the most diversely cast Marvel film to date, in which every iconic character has been rethought and improved: Tilda Swinton, Chiwetel Ejiofor, Mads Mikkelsen and Benedict Wong all excel as and exceed their iconic characters. With astounding reverence to the sources, the origin film hits every key point while deepening the resonance of each. Whereas Kirby's grand designs are generally sublimated in the Marvel films (due to lawsuit issues), Ditko's cosmology is recognizably explicit in every frame of the film: the costume, the molecular dimensions, the Greenwich sanctum. But deephead readers will also recognize spirits of the celebrated early '70s Englehart and Brunner run, DeMatties and Green's "Into Shamballa" graphic novel (1986), and Vaughan and Martin's "The Oath" arc (2013). Pink Floyd famously invoked the Doctor twice, and this movie wryly winks back with two Pink Floyd references. This excellently made film is one of Marvel's best, accessible to all while being everything that a fan could have hoped for.